Waltz of the Wizard is for the geeks and the magic fans of the world. Explore your tower and create potions and visit magical worlds in virtual reality. Waltz of the Wizard makes you Harry Potter of your dreams. Cook up, wizard. Waltz of the Wizard is quite misleading for a VR simulation game title since there’s no waltzing in the gameplay at all. However, this game is outstanding and is the best in its genre yet. 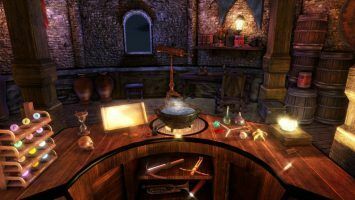 It takes the player in a very colorful and mysterious tower wizard’s room cook up some potion and do some magic as new formulas is made up. Virtual reality has never been this magical and satisfying with the things you can do in your tower room. Get some snow globes and copy the sound keys in your lyre to teleport to other places. There’s some mystery to those places as well. Snowy cliffs, dark castle hallways and some dark alien observatory. And being a wizard gets you the power to make some powers out of ingredients you have in your table. Have some fireball power, transmutation and some cool, evil powers to use. Definitely a good game to have when you have an HTC Vive. Waltz of the Wizard may well be a game that takes more players out from the movies because of its fantasy background. Indeed the gameplay was spot on in terms of graphics and it takes some elements from existing games and incorporating it to magic spells inside the wizard’s tower. Take the Air Drawing power for example, it’s like Tilt Brush but only a hint of it inside Waltz of the Wizard. You can draw something in the air with your controller and actually hold it and throw what you have drawn around. That is something everyone should check out. The Fireball hand power is truly amazing. When every single game in VR tends to favor guns and swords, the waving of the hand while throwing flames around is just a joy to do. Really a good game and a must have in everyone’s collection. Waltz of the Wizard can be the VR game you will enjoy. The game is amazing but some things are not just quite right at first try. Waltz of the Wizard can be creepy with a skull talking to you as you play the game. Maybe it is just a fact of the wizard world that magic can come from a talking skull but that can be a little tricky to recommend to people who are conservative with these kind of things. A little tutorial with a mentor wizard might be child-friendly. The world inside a tower can be boring sometimes. You can do a lot of magic but you can’t actually go around your room even with some teleportation spell or something. Take Raw Data’s exploration style for example. Everyone’s gonna go beyond the desk and take a look around that cozy castle.